The Congressional Black Caucus (CBC) is a caucus made up of most African American members of the United States Congress. U.S. Representative Karen Bass from California has chaired the caucus since 2019. "Black people have no permanent friends, no permanent enemies, just permanent interests." The caucus describes its goals as "positively influencing the course of events pertinent to African-Americans and others of similar experience and situation", and "achieving greater equity for persons of African descent in the design and content of domestic and international programs and services." The CBC encapsulates these goals in the following priorities: closing the achievement and opportunity gaps in education, assuring quality health care for every American, focusing on employment and economic security, ensuring justice for all, retirement security for all Americans, increasing welfare funds, and increasing equity in foreign policy. The Congressional Black Caucus is one of the world's most esteemed bodies, with a history of positive activism unparalleled in our nation's history. Whether the issue is popular or unpopular, simple or complex, the CBC has fought for thirty years to protect the fundamentals of democracy. Its impact is recognized throughout the world. The Congressional Black Caucus is probably the closest group of legislators on the Hill. We work together almost incessantly, we are friends and, more importantly, a family of freedom fighters. Our diversity makes us stronger, and the expertise of all of our members has helped us be effective beyond our numbers. Mark Anthony Neal, a professor of African-American studies and popular culture at Duke University, wrote a column in late 2008 that the Congressional Black Caucus and other African-American-centered organizations are still needed, and should take advantage of "the political will that Obama's campaign has generated." The caucus has grown steadily as more black members have been elected. At its formal founding in 1971, the caucus had thirteen members. As of 2019, it had 55 members, including two who are non-voting members of the House, representing the District of Columbia and the U.S. Virgin Islands. As of 2019, there have been eight African-American senators since the caucus's founding. The six black senators, all Democrats, who are or have been members of the Congressional Black Caucus are Senator Cory Booker of New Jersey, elected in 2013, and Senator Kamala Harris of California, elected in 2016, both currently serving; former Senators Carol Moseley Braun (1993–1999) Barack Obama (2005–2008) and Roland Burris (2008–2010), all of Illinois; and former Senator Mo Cowan (2013) of Massachusetts. Burris was appointed by Illinois Governor Rod Blagojevich in December 2008 to fill Obama's seat for the remaining two years of his Senate term after Obama was elected President of the United States. Cowan was appointed to temporarily serve until a special election after John Kerry vacated his Senate seat to become U.S. Secretary of State. Senator Edward Brooke, a Republican who represented Massachusetts in the 1960s and 1970s, was not a member of the CBC. In 2013, Senator Tim Scott, Republican of South Carolina, also chose not to join the CBC after being appointed to fill Jim DeMint's Senate seat. The caucus is officially non-partisan; but, in practice, the vast majority of African Americans elected to Congress since the CBC's founding have been Democrats. Eight black Republicans have been elected to Congress since the caucus was founded in 1971: Senator Edward Brooke of Massachusetts (1967–1979), Delegate Melvin H. Evans of the Virgin Islands (1979–1981), Representative Gary Franks of Connecticut (1991–1997), Representative J. C. Watts of Oklahoma (1995–2003), Representative Allen West of Florida (2011–2013), Senator Tim Scott of South Carolina (2013–present), Representative Will Hurd of Texas (2015–present), and Representative Mia Love of Utah (2015–2019). Of these eight, only half have joined the CBC: Evans, Franks, West, and Love. There are currently no Republicans in the CBC. Edward Brooke was the only serving African-American U.S. Senator when the CBC was founded in 1971, but he never joined the group and often clashed with its leaders. In 1979 Melvin H. Evans, a non-voting delegate from the Virgin Islands, became the first Republican member in the group's history. Gary Franks was the first Republican voting congressman to join in 1991, though he was at times excluded from CBC strategy sessions, skipped meetings, and threatened to quit the caucus. J. C. Watts did not join the CBC when he entered Congress in 1995, and after Franks left Congress in 1997, no Republicans joined the CBC for fourteen years until Allen West joined the caucus in 2011, though fellow freshman congressman Tim Scott declined to join. After West was defeated for re-election, the CBC became a Democrat-only caucus once again in 2013. After Democrat Mo Cowan stepped down in July 2013, the political situation bore a striking resemblance to four decades earlier: The only serving black Republican congressman (Edward Brooke in 1971, Tim Scott in 2013) was a U.S. Senator who refused to join the CBC. In 2014, two African-American Republicans were elected to the House. Upon taking office, Will Hurd of Texas declined to join the caucus, while Mia Love of Utah, the first black Republican congresswoman, joined, declaring an intent to "try to take that thing apart from the inside out," saying that "in order to effect change, you can't do it from the outside in." All past and present members of the caucus have been African-American. In 2006, while running for Congress in a Tennessee district which is 60% black, a white candidate Steve Cohen pledged to apply for membership in order to represent his constituents. However, after his election, his application was refused. Although the bylaws of the caucus do not make race a prerequisite for membership, former and current members of the caucus agreed that the group should remain "exclusively black". In response to the decision, Rep. Cohen referred to his campaign promise as "a social faux pas" because "It's their caucus and they do things their way. You don't force your way in. You need to be invited." Quite simply, Rep. Cohen will have to accept what the rest of the country will have to accept—there has been an unofficial Congressional White Caucus for over 200 years, and now it's our turn to say who can join 'the club.' He does not, and cannot, meet the membership criteria unless he can change his skin color. Primarily, we are concerned with the needs and concerns of the black population, and we will not allow white America to infringe on those objectives. Later the same week Representative Tom Tancredo, Republican of Colorado, objected to the continued existence of the CBC as well as the Democratic Congressional Hispanic Caucus and the Republican Congressional Hispanic Conference arguing that "It is utterly hypocritical for Congress to extol the virtues of a color-blind society while officially sanctioning caucuses that are based solely on race. If we are serious about achieving the goal of a colorblind society, Congress should lead by example and end these divisive, race-based caucuses." A predecessor to the caucus was founded in January 1969 as a "Democratic Select Committee" by a group of African-American members of the House of Representatives, including Shirley Chisholm of New York, Louis Stokes of Ohio and William L. Clay of Missouri. African-American representatives had begun to enter the House in increasing numbers during the 1960s, and they had a desire for a formal organization. The first chairman, Charles Diggs, served from 1969 to 1971. All the members of the caucus landed on the master list of Nixon political opponents. This organization was renamed the Congressional Black Caucus in February 1971 on the motion of Charles B. Rangel of New York. Founding members of the caucus were Shirley Chisholm, William L. Clay Sr., George W. Collins, John Conyers, Ronald Dellums, Charles Diggs, Augustus F. Hawkins, Ralph Metcalfe, Parren Mitchell, Robert Nix, Charles Rangel, Louis Stokes, and Washington D.C. Delegate Walter Fauntroy. Nixon refused to meet with the newly formed group, and so the group chose to boycott his 1971 State of the Union, leading to their first joint political victory and press coverage. In 1977, the organization was involved in the founding of TransAfrica, an education and advocacy affiliate that was formed to act as a resource on information on the African continent and its Diaspora. 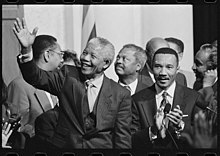 They worked closely with this organization to start the national anti-apartheid movement in the US, Free South Africa Movement (characterized by sit-ins, student protests, it became the longest lasting civil disobedience movement in U.S history) and to devise the legislative strategy for the Comprehensive Anti-Apartheid Act of 1986 that was later vetoed by Ronald Reagan, and subsequently overridden. The organization continues to be active today and works on other campaigns. In late 1994, after Republicans attained a majority in the House, they announced plans to rescind funding for 28 "legislative service organizations" which received taxpayer funding and occupied offices at the Capitol, including the CBC. Then-chairman Kweisi Mfume protested the decision. The House did abolish the legislative service organizations, including the CBC, by a voice vote on H.Res.6 on January 4, 1995, which prohibited “the establishment or continuation of any legislative service organization..." The CBC reconstituted as a Congressional Member Organization. The caucus is sometimes invited to the White House to meet with the president. It requests such a meeting at the beginning of each Congress. ^ a b c d Office of the Historian (2008). ""Creation and Evolution of the Congressional Black Caucus," Black Americans in Congress, 1870–2007". History, Art & Archives, U.S. House of Representatives. Washington, D.C.: U.S. Government Printing Office. Retrieved April 17, 2016. ^ "The History of the Congressional Black Caucus (CBC)". United States House of Representatives. Retrieved April 18, 2016. ^ a b c d e f g "Leadership". Congressional Black Caucus. Retrieved January 17, 2018. ^ a b c d e f g "Congressional Black Caucus". Congressional Black Caucus. November 28, 2018. ^ "Congressional Black Caucus Chair Cedric Richmond Says Goodbye to Seat as he Prepares to Pass "Chair" to Rep. Karen Bass". January 2, 2019. ^ "The Blue Wave Of Black Politicians Gets Sworn In". January 3, 2019. ^ "Priorities of the Congressional Black Caucus for the 109th Congress". U.S. House of Representatives. Archived from the original on December 30, 2005. Retrieved April 17, 2016. ^ Jackson, Camille (December 19, 2008). "Hitting the Ground Running". Duke University This Month at Duke. Retrieved February 7, 2009. ^ "Brooke, Edward William, III". History, Art & Archives: United States House of Representatives. January 3, 2015. Retrieved March 2, 2015. ^ Barnes, Fred (March 17, 2011). "Rep. Allen West – and the Congressional Black Caucus". The Weekly Standard. Retrieved March 2, 2015. ^ Southall, Ashley (January 5, 2011). "Republican Allen West Joins Congressional Black Caucus". The New York Times. Retrieved January 5, 2011. ^ Alvarez, Lizette (November 20, 2012). "Republican Concedes House Race in Florida". The New York Times. ^ "Congressional Black Caucus Members". Congressional Black Caucus. Retrieved January 26, 2015. ^ Ross, Chuck (January 6, 2015). "Republican Mia Love Joins Congressional Black Caucus, Group She Wants To Reform". Daily Caller. ^ a b Hearn, Josephine (January 23, 2007). "Black Caucus: Whites Not Allowed". Politico.com. Retrieved January 23, 2007. ^ Ta-Nehisi Coates (August 8, 2008). "Should a white guy get to join the black caucus?". The Atlantic. ^ "Tancredo: Abolish black, Hispanic caucuses". MSNBC. January 25, 2007. Retrieved April 19, 2009. ^ "History". Congressional Black Caucus. Retrieved February 6, 2016. ^ a b "TransAfrica". African Activist Archives. Michigan State University. Retrieved April 17, 2016. ^ "Senate Rebukes Reagan". The Courier. October 3, 1986. p. 28. Retrieved February 20, 2016. ^ "thomas.loc.gov 104th Congress, H.Res.6, Section 222" (PDF). ^ Cortés, Carlos E. (2013). "House of Representatives, U.S.". Multicultural America: A Multimedia Encyclopedia. SAGE Publications. p. 1118. ISBN 9781452276267. ^ a b Josephine Hearn (February 13, 2007). "Black Caucus to Make Rare White House Visit". The Politico. ^ "Congressional Black Caucus Chairmen and Chairwomen, 1971–Present". Black Americans in Congress. U.S. House of Representatives. Retrieved November 27, 2010. ^ "Membership". Congressional Black Caucus. Retrieved March 13, 2018. Singh, Robert (1998). The Congressional Black Caucus: Racial Politics in the U.S. Congress. Thousand Oaks, California: Sage.